Where the plot is thin at times, the movie makes up for it with stunning visuals and great characters. It's not what fans of the supremely popular A Vision of Escaflowne series will expect. It's not a cerebral film. It's a straightforward, visceral action-movie, gorgeously realized by the series originators, Hajime Yatate, Shoji Kawamori, and Kazuki Akane (Director). You are instantly drawn in; the experience keeps you on the edge of your seat as the opening credits roll. Fans of the Escaflowne series will recognize the names and some of the characteristics of the principle players; almost all of them have changed. Some as much as 75% of the motivations and physical appearance have been altered. With so many important side characters from the series, a sacrifice clearly has been made. Introductions are brief and fans of the Furry people will be somewhat disappointed with the small parts left to Merle, the catgirl, the Mole man and the Gold & Silver twins. The movie's opening follows Van, the leader of the "White Dragon" Clan and he attempts to rescue the armor, Escaflowne. His entrance is dramatic and violent. Promoters of an English version will have a hard time with the censors when the movie appears in the USA. Van's character is warlike, with very little of the stumbling younger brother who needs to learn how to fight. This Van has learned that lesson well. The connection between Van and Folken is not famial anymore. Folken is unrecognizable as the head of the "Black Dragon" clan. He attempts to contact a kindred spirit to join him in the destruction of Gaia. This soul is Hitomi, a depressed young woman of Earth. Hitomi Kanzaki is a schoolgirl on the verge of a decision. She feels there is no meaning to her life. She is contemplating suicide, she wishes she could just "fade away". Her best friend interrupts a reverie of the past. When Hitomi was a little girl, she had a vision where time stopped. She was with her parents on a train when all motion ceased and she saw a young man with intense eyes staring at her. It only lasted seconds but has haunted her life ever since. Nothing in her life has added up to that moment. She feels like floating away. During this reverie she sees Folken, the leader of the Black Dragon Clan, who wishes the destruction of Gaia, calling to her. He senses a kindred spirit that longs for destruction. She is confused between reality and dream. Her friend is sympathetic but Hitomi rejects the connection, driving her away. After dismissing her friend, Hitomi moves closer to her dream and is transported, not to Folken, but to the interior of the fighting armor, Escaflowne. When Van frees the mecha from Folken's minions, Hitomi literally tumbles into his arms and fulfills the prophecy of the Winged Goddess. The story is rather thin. The characters are hurriedly introduced and not given much to do except support Van, Hitomi, Folken and Folken's chosen champion Dilandau. The problem of his gender-confusion is non-existent. Millerna, Allen's lusty sidekick, Hitomi and even Merle are satisfyingly female and the boys, Allen, a resistance leader, Geddes, his pilot, Van and Dilandau, have enough testosterone to fire up a football team. Dilandau's fight is not as manic or personal as in the series. Is this enough to fuel a movie? Actually, yes, it is. The visuals are stunning, and given the short time we have to grow to care about these people (in contrast to the length of the epic series), the heart stops and starts at just the right emotional cues. 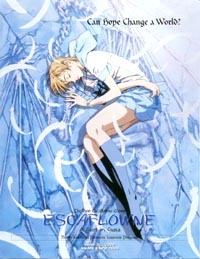 As an enormous fan of The Vision of Escaflowne, I was in Heaven sitting in the second row center of the Midnight showing of Escaflowne: A Girl in Gaea at AnimeExpo 2000. I am sorry that the rest of you will have to wait at least two years to have this experience yourself.